These days Samwise Didier is better known as the lead singer for Level 80 Elite Tauren Chieftain, but he's been a Blizzard employee since 1991, and has been churning out artwork (like the above Starcraft logos) for years. He also has the dubious title of the creator of the Pandaren race. You can check out a huge chunk of his artwork in the gallery on the Sons of the Storm website. He has a massive head of metal hair, apparently never wears pants, and is overseeing the artwork on Starcraft 2. We sat down with him at BlizzCon not long before L80ETC opened for Ozzy Osbourne, and chatted him up about his job. Read on for the full interview. One question a lot of our people are wondering is do you own any pants? I actually wear pants when I have to go to court or weddings. Yeah, I do. I actually wear pants when I have to go to court or weddings. Weddings? [laughter] Not anymore, no. Now that the statute of limitations is nearly up. That is right, yeah. There are certain things I can speak about now. Do you feel like you may have missed your calling as, like, a metal rock God at some point? [laughter] Basically what I do now is still karaoke. It is just for slightly bigger audiences. And a backing band that includes millionaire company presidents. Yeah. I think that is probably some of the reason why we are here. And it is nice to be able to just yell "For the Horde!" and then have half of the fans hate you and half of them love you. And the ones that are with the Horde, half of those guys hate you, but it is all good. As long as I can't see past the first three rows, then I am good. You're going to open for Ozzy Osbourne. Did you ever think when you started working at Blizzard this was going to happen? Part of your master plan. Yeah. I mean, it was very difficult to coordinate, but it worked out. No, I had no idea. [loud sound from the room next door] That was the thunder from the experience. That was from mentioning Ozzy Osbourne. Uh, no. Had no clue. I didn't get to see ... Ozzy was about 20 feet doing his practice set and it was just phenomenal. I was the only fool standing up, but that is all right. I will be the fool standing up sweating in front of everybody. Then I had to go meet people. I'm like, "Oh! I forgot about that! Hi. Nice to meet you!" I'm sure there will be a lot of people standing up tonight ... So tell us what your job is in regards to Starcraft. I am the art director on the game. Back when we started, I was providing a lot of concepts, working on models and textures and all that. Now the bulk of the art is on its way to being done. There are still things that we need to hit up, but a lot of it now is just sort of overseeing, making sure that anything new that has been generated has that kind of Starcraft feel or it looks enough Zerg, it looks enough Protoss; that sort of thing. Although, you know we have some guys on the team that will make some artwork ... and I don't want to sit there and tell them no and nitpick them to death. 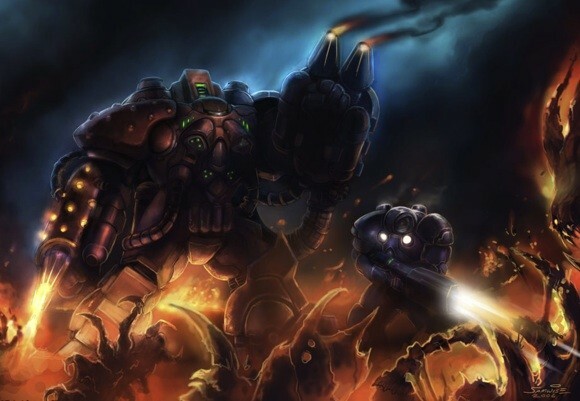 I want to make it so where it is there idea but it looks like what it is supposed to be for Starcraft. Does that extend to like the Battle.Net experience with these decals and avatars that are coming or is that someone else handling that? I don't know actually what has been shown, but myself and a few of the artists have worked on a lot of the decals right now and a lot of the kind of placeholder achievement art or things like that. I always end up doing a lot of the World of Warcraft buttons. So when little buttons needed to be made for Starcraft, I am like, "OK. I can't get out of this one. I have to do these, too." But yeah. We meet a couple times a week and then we have our main art meeting once a week where we just have everyone look at the game, offer a few little nitpicks or tweaks here and there, but the bulk of it right now, it is pretty easy because these guys have been working on this game for a few years now. They have got the look down. So my job is a little bit easier then.